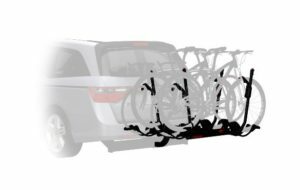 Thule T2 Pro XT, Yakima Dr. Tray or Swagman Chinook are maybe the best 4 bike platform bike racks but are not the only ones. Platform or tray style bike carriers are very versatile, accommodating almost any bike style, regardless of wheel size, frame, or suspension. These are ideal for fat bikes, road or mountain bikes, or suspension ones. Fits 2-inch receivers. 4-bike platform hitch racks provide a very good stability, eliminating sway problems. The contact with frames is minimal. See a full range of 4-bike platform racks or explore some carriers below. 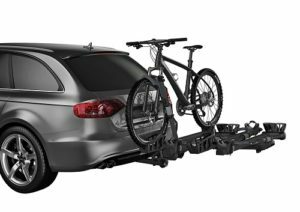 T2 Pro XT 4-bike platform bike rack is extremely well built and it can be considered the benchmark for hitch bike carriers. It is an upgraded version of Thule T2, keeping the innovative features, like the remote tilt handle and tool-free vehicle attachment system. It has the smoothest user-friendly release mechanism. It fits 2-inch and 1.25-inch receivers and carries up to 4 bikes with Thule T2 Pro XT bike Add-on (sold separately). 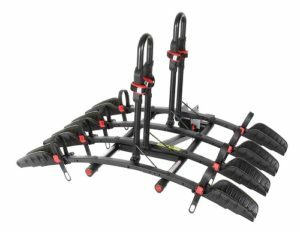 An ideal bike rack for fat bikes, downhill, carbon frames and mountain bikes and fits 20-29-inch wheels and up to 5-inch tires without adapters. Compact and lightweight design, the arm can fold when not in use for gate access. Strong, easy to use locking attachment system to fit any 2″ receiver. High resistance wheel straps with zamack buckles and soft pads fit all rims and tire sizes. Adjustable padded arm. 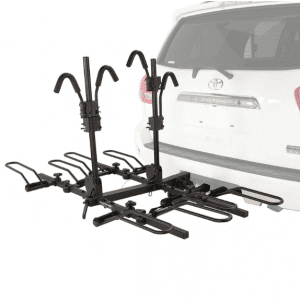 Yakima Hold Up is a 4-bike platform hitch rack using the Add-on which is sold separately. Well suited to have multiple bikes of different styles or heavy ones. Its beefed-up arm pivot makes it stronger and the side-to-side adjustability reduces the chance for bike-to-bike interference. It comes with locking hitch pin and lock cores for the cables. StrongArm design enables you to load your bike quickly. 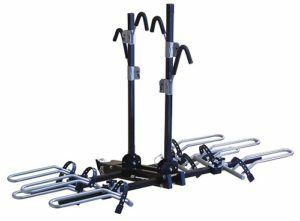 The SportRider 4 is a heavy duty 4-bike hitch rack that will fit almost any style of bike using a padded universal top clamp and adjustable wheel holders. It comes pre-assembled and folds flat against vehicle when not in use. It is seen as a very stable and sturdy bike rack. Maximum bike wheel base: 60″. Maximum tire width: 3″. 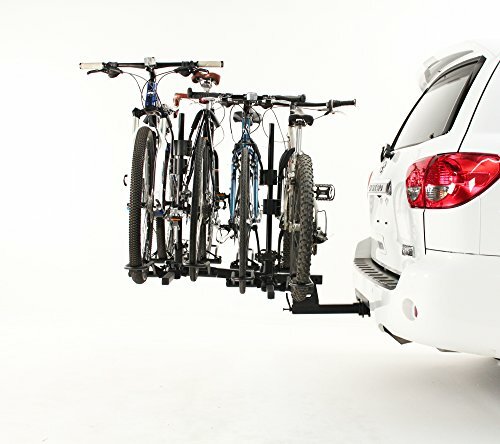 A wallet-friendly 4-bike hitch bike carrier that holds 4 bicycles at once. It is designed for 2-inch receivers and wheel straps are included. Center arms fold down to allow access to the rear-of-vehicle without removing the rack. Rack folds up when not in use. Fits 20-29″ wheel sizes and the maximum load per bike is 35 lbs. Discover the full range of 4-bike platform hitch carriers.